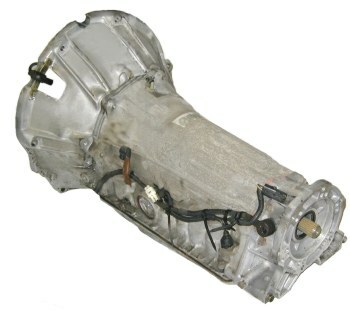 The Aisin Warner AW4 transmission is an automatic shift, four-speed overdrive transmission used in the 1987-2001 Jeep XJ Cherokee and MJ Comanche models. Its only year in the ZJ Grand Cherokee was 1993, and only with the six-cylinder. The AW4 is predominantly found behind the AMC 4.0L (242 ci) I6 engine. The AW4 was also used behind the AMC 2.5 four-cylinder. A similar transmission is used in some Toyota RWD applications, known as the A340. Gear Ratios for the AW4 are 2.80, 1.53, 1.00 & .75. The AW4 is a light to medium-duty transmission. Ours, our callers', and customers' experiences with the AW4 are less than stellar. They have a tendency to generate excessive amounts of heat, and are known for unnecessarily consuming more engine power than some other automatics. The shift points in the AW4 feel odd, and the spotty engagment of the lockup torque converter is idiosyncratic. But it is a decent transmission, and if kept cool and maintained it can offer good service within its range. The AW4 as found in Jeep vehicles has a length of 25-3/8". The AW4 has a removable bellhousing with a port for the crank position sensor. The case is smaller in diameter than most automatics, and features cast-in ribbing down the rear half of the case. The earlier Jeep AW4 has a 21 spline output shaft for connecting to the transfer case input shaft. With the release of the HO 4.0L in the 1991 the AW4 was upgraded to a 23 spline output shaft. The AW4 may be identified as a model #30-43LE for 2wd versions and as a model #40-30LE for 4wd versions. The Jeep AW4 was factory-married to the Jeep Jeep New Process (aka New Venture) Model 231 transfer case, in addition to the NP242 Full-Time transfer case. It is possible to adapt the AW4 to the Jeep Dana 300 transfer case in passenger side and driver side drop by using Novak kit #153 in the event one is installing a 4.0L into an '80s era CJ. The AW4 and the 2.5L engine was a rare combination in the XJ / MJ model Jeeps as spec-to-build. They recieved 4.56 axle ratios. The transmission case and internals were identical to the 4.0L version of the AW4, but the detachable bellhousing and torque converter were unique to the 2.5L I4 engine. Thanks to J. Janisko for this information. As the AW4 was married to the Jeep engines mentioned above, it is OEM compatible with them. The AW4 is an electronically controlled transmission, and is therefore compatible only with the 4.0L engine and its PCM package.